We all know that movement and exercise during the day is what we ‘should’ be doing, but how can we achieve this when we’re in an office for 8+ hours? 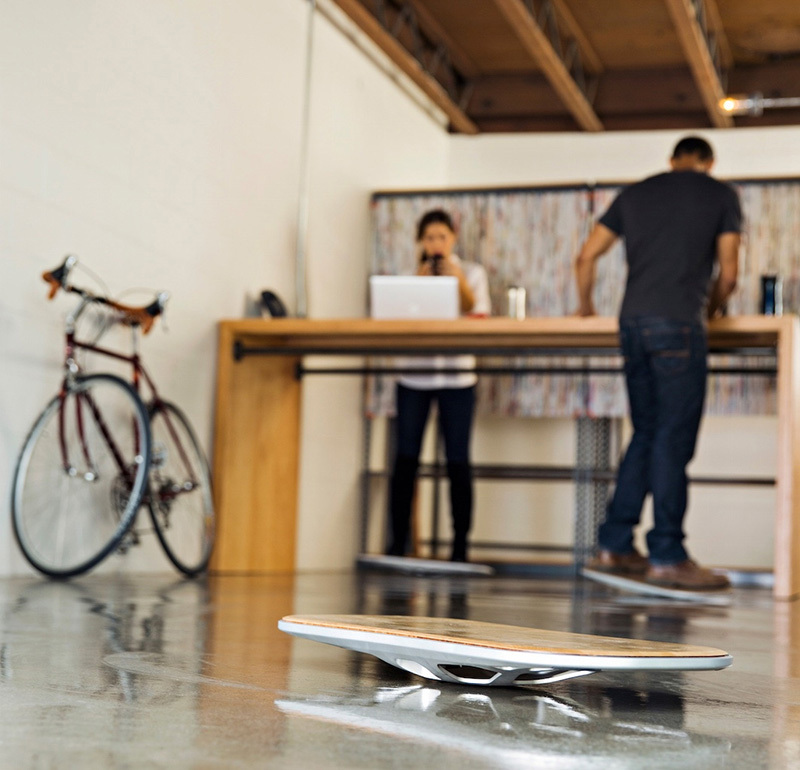 Luckily there are ways that we can get active when at a desk, during a quick break or even in a meeting. Research conducted by the British Chiropractic Association found that 32 per cent of workers spend 10 hours+ sitting every day and that half of us don’t even take a break to leave our desks during our lunch break. Increasing our movement and activity during the working day will helps to maintain fitness and fight off potentially life threatening disease, reported to be caused by sitting for long periods on a regular basis. If you’ve no time spare during the day to exercise (even though there’s plenty of exercises that can be done while working!) then getting up earlier may be the only option. You don’t have to get up hours early and drive to a gym, completing a simple set of floor exercises for 10 minutes at home is a good option. Going for a walk around the block (taking the dog for a walk if you have one) will set you up for the rest of the day, make you feel better about yourself and proud of the additional effort you’re making. If you do decide to get up earlier then set the new time and stick to it, it’s important to get regular sleep as well as enough sleep each night. Set an alarm that’s not too abrasive on your ears and don’t hit the snooze button! Rather than parking as close as you can to the office, train station or whatever transport hub you may use, park further away. It’ll be quieter and you’ll benefit from the extra distance covered walking to your destination. Another advantage of parking further away, where it’s less busy, is you’re less likely to get flustered trying to find a parking space, therefore reducing your stress levels. It may even be possible to find cheaper of free parking if you’re not trying to get a prime space to save you a walk, imagine the yearly savings of cheaper or free parking every day! If you work in London then it’s (usually) easier to jump on a tube rather than walk between stations. If you want some motivation to use your legs between stations rather than travelling by rail then take a look at the map below. The image illustrates the calories burned by walking between tube stations in the UK capital. If there are stations that, until now, you’ve used the tube to travel between, imagine the exercise you’d get over the course of a year. There are many exercises you can do while sat at your desk. The advantage of these is that you don’t have to find any extra time or somewhere quiet to do them so as not to disturb colleagues. For more information regarding the above exercises click here. It’s very rare that lunch will take a full hour to consume, it’s usually more like 10 minutes. If you’re lucky enough to get an hour for lunch then you probably have 50 minutes to utilise for exercise. Why not use this period for communal exercise activities? Start a walking club or play football in the local park with your colleagues. 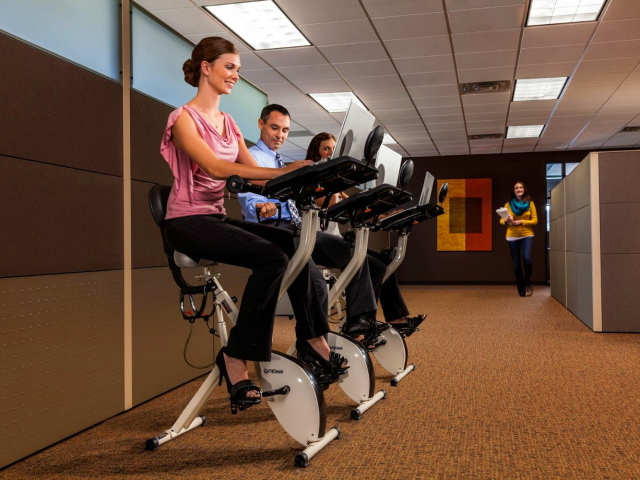 As well as the additional exercise these activities are great for morale and an engaged company culture. The important thing is not to waste your lunch break sitting at your desk browsing the internet, probably about how you should be more active, get out and take a walk in the fresh air! If you don’t want to leave the office but still need to get some activity into your day then why not invest in a second hand Wii or Kinect for the XBox360/Xbox One? Having fun playing computer games, but still benefiting from being active and getting out of your chair, leaves little to complain about or object to. With the variety of compatible games available there’s something for everyone too! You’ll need to have a room to play the games but it could be the communal lunch room or a meeting room that’s free during the lunch period. Using the stairs as much as possible will add a considerable amount of additional exercise to most people’s day. Whether it’s the stairs in the office or the ones in the tube station that 99% of people avoid, using the stairs is a great way to include an additional work out. As well as the extra movement you get you’ll also have the satisfaction of encouraging others to following suite! The only potential downside is that for the first couple of days you might feel like the center of attention while your colleagues adjust to your new seating arrangements. Don’t worry though, once they see the benefits they’ll stop with the jokes and all want one! 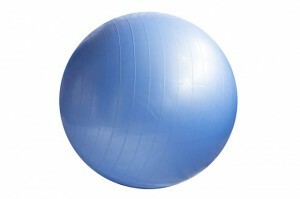 If you want a slightly more subtle version then there’s the hybrid ‘balance ball chair’ pictured below. 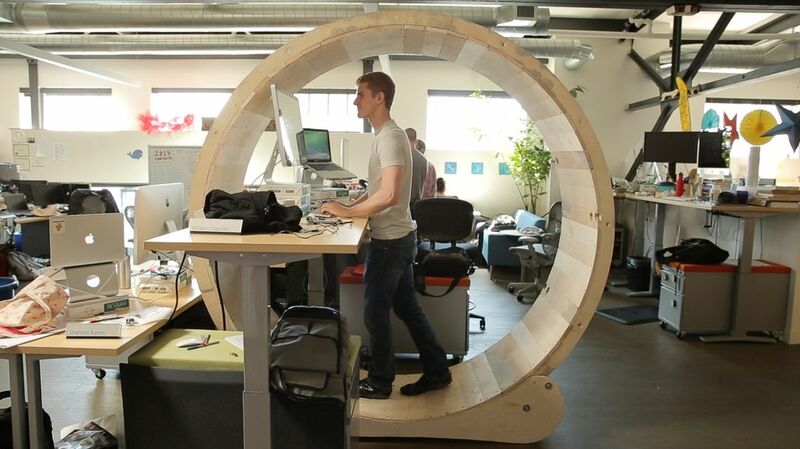 My Personal favourite – The hamster Wheel Desk! Rather than stuffing everyone into a room to discuss strategy or challenges, why not all go for a walk and discuss it in the fresh air?! With the additional clean, non air conditioned air and additional inspiration you’ll probably get more out of the meeting on a professional level as well as a healthy one. There are numerous items of exercise equipment that don’t weigh much and easy to transport to the office. Resistance bands and skipping ropes are just two examples of easy to carry items that will help you to exercise wherever you are. Do you email people in the same room as you or phone a colleague that’s a couple of floors away? Why not get and and walk over to them for a face to face discussion. 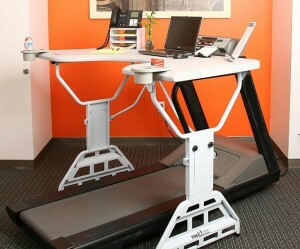 It’s a much nicer way to communicate plus you get the additional exercise and time away from your desk. Starting a sports club is a great way to get more people to exercise with you as well as having fun and a bit of healthy competition. If the activity is straight after work then it’s more convenient and the fact that your colleagues are taking part will encourage you to keep it up and not give up. 63% of men and 52% of women said that sporting success (i.e. their team winning) has an impact on their approach to work. 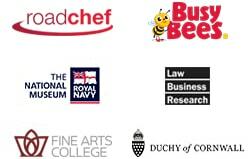 47% women and 40% of men said that sporting success lifts their mood and makes them more productive in their jobs. 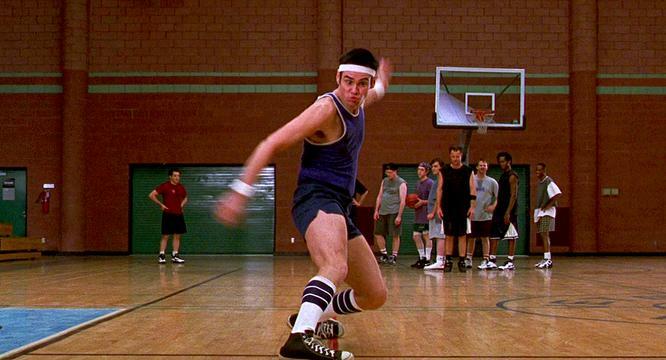 A fifth of men said sport increases their motivation at work compared to 12% of women. Sports increase morale, engagement and, if you organise them, display organisation and leadership skills which are great for your career progression. 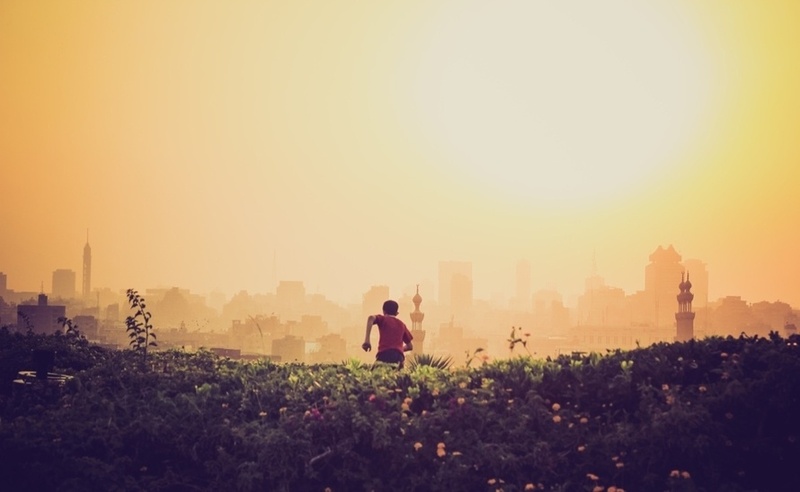 Being active doesn’t need to involve large open spaces or a gym. Installing tabletop games such as air hockey, Foosball, table tennis or pool will encourage more activity and movement while also having fun and engaging in some healthy competition. For example if you weigh between 105-120 lbs., you may burn between 8.4 – 9.5 calories per minute and if you weight between 170 and 200 lbs., you may burn between 13.2-15.5 calories per minute. 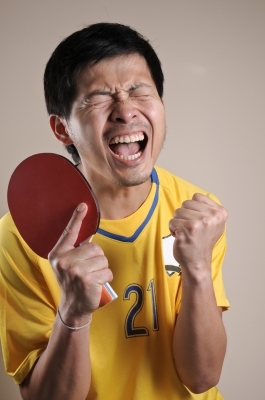 That’s 570 and 930 calories burned in just one hour of ping pong! Don’t forget that as well as exercise, a healthy and balanced diet is important for a healthy lifestyle. The above exercise ideas won’t do you much good if you’re eating junk food every lunchtime and snacking throughout the day!